Building Information Modelling: what are you waiting for? It seems that almost everyone in construction is talking about Building Information Modelling (BIM) at the moment. A week doesn’t go by without at least one or two invites to a BIM conference, webinar or workshop. But when it comes to manufacturers – and by this I mean construction products manufacturers – that seems to be about it: people are talking about it, but not engaging. I read a recent statistic that estimated that only 20% of manufacturers were engaging in BIM, yet 44% are planning to have content available in 2014. Given the hyperbole that surrounds this topic and the potential benefits, this is a surprisingly low figure. Why are construction manufacturers not engaging? I can understand that companies may be reluctant to invest when the economic climate is somewhat challenging, but compared with the benefits, the level of investment is small – so what are the real reasons for this reluctance? There are a number of reasons, but most seem to stem from a lack of understanding, a lack of demand from clients, or simply reluctance to change. In addition to this there are still some contractual issues to be overcome. Many see this as a means by which design responsibility for the project can be passed all the way down to the smaller sub-sub-contractors, or even to the manufacturers who are not best placed to deal with such liability. This lack of understanding is based around not knowing how to engage. There is a staggering amount of discussion and debate being dedicated with this subject and a huge amount of column space is being dedicated to this topic. This, coupled with a whole new language and associated jargon, could leave even the best of us befuddled. To simplify things, there are two aspects to BIM for the manufacturer - 3D product modelling – enabling the spatial constraints of the product to be visualised - and product data capture. The first requires a three dimensional ‘virtual’ product model; the second can be as simple as spreadsheet-based product data tables. Employ a third party consultant to create product models, often referred to as ‘families’. This has the benefits of being immediate and, depending on the consultant, would give content of a number of the available software platforms, e.g. Autodesk Revit, ArchiCAD, Bentley, etc. However, depending on your product range, this can prove to be expensive and gives you high maintenance costs if your products change in the future. Create Revit content from Inventor. If you have a limited range of fixed size products and you have already designed them in Inventor, this software has an embedded suite of commands that will facilitate creation of Revit content. The downside is that the content created in this way is somewhat visually crude, is fixed in size and has no flexibility for size variations. Invest in a software platform and train or recruit your own operatives to create content. This takes time, but does give you complete control of the content and the ability to introduce variations or new products at any time. The software itself can be relatively cheap, often just an upgrade of an existing CAD platform. Of course many product manufacturers, like Colt, are also specialist contractors. 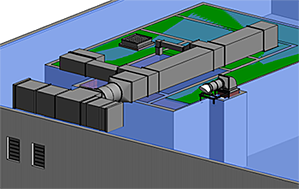 In this case, engaging in BIM introduces another requirement, being able to operate a project in a BIM environment. If this is the case then the third route is almost certainly the best option. The reason for the lack of demand is more difficult to explain, but from our own experience, there are probably two principal causes. The demand is not filtering its way clearly down to the bottom of the food chain. Construction supply chains can often be 5-6 layers deep before the manufacturer gets involved. Where a project could be operating in a BIM environment, the number of levels in the chain of command can often filter out these intentions and content is frequently sourced elsewhere, often by the design team creating their own content, downloading generic content or simply leaving it out. The demand can be watered down by lack of commitment. Many projects start off with good “BIM intentions”, but by the time the project reaches the construction phase, these good intentions have been filtered by a reluctance to move away from traditional procurement processes. We have been involved in numerous high profile projects that are now promoted as having been delivered in BIM, but the reality of our experience has been that they were no different, with our information being submitted in traditional 2D drawings. So is this a reluctance to change at the higher levels of the construction procurement process or a reluctance to impose change on the lower levels? Either way, if the UK construction industry is to meet the demand of the UK government procurement mandate in 2016, change is going to be necessary. For the construction industry the benefits are mostly time related, less time wasted through more the use of more effective design tools, fewer co-ordination mistakes and less post-contract change. For the developer/Facility Manager, the advantage is far better operational information and control.